Julius von Bismarck er um þessar mundir búsettur og starfandi í Berlín. Hann stundaði nám við Berlin University of the Arts og Hunter College í New York og var auk þess fyrsti listamaðurinn í gestavinnustofu hjá CERN. Verk hans, Image Fulgurator, hlaut Prix Ars Electronica verðlaunin og fékk víðsvegar góðar undirtektir hjá breiðum áhorfendahópi, auk þess að vera birt í ýmsum fjölmiðlum á borð við Wired, Arte og The Creators Project of Vice. Julian Charrière er konsept listamaður sem um þessar mundir er búsettur og starfandi í Berlín. Hann lærði myndlist við École cantonale d’art du Valais í Sviss áður en hann fluttist til Berlínar til að ljúka námi. Árið 2013 útskrifaðist hann frá stofnun Ólafar Elíassonar, Spatial Experiments, sem var samstarfsverkefni við Berlin University of Arts. Charrière notar ýmsar listrænar aðferðir, þar á meðal ljósmyndun, gjörningalist, skúlptúr- og vídjógerð til að taka fyrir hugmyndir um tíma og tengsl samfélags við náttúruna. Báðir listamenn hafa sýnt víðsvegar um heiminn. Bismarck og Charrière unnu saman rýmisgjörninginn “Some pigeons are more equal than others” sem hlaut góðar undirtektir á Feneyjartvíæringnum fyrir Arkitektúr árið 2012. KUNST eða LIST er verkefni sem samanstendur af staðbundnum heimildarljósmyndum unnum af Julius og Julian. Ljósmyndirnar fanga augljósar og einfaldar athafnir listamannanna, þar sem þeir hafa skrifað ensk náttúruheiti stórum stöðum á viðeigandi landslög. Einföld heiti eins og lava (hraun) og forest (skógur) eru spreyjuð á yfirborð samsvarandi náttúruflata. Verkin draga athygli að hinu augljósa í myndfletinum, hinu augsýnilega og vitnar í kröfur samtímamyndlistar um yfirhönd tungumálsins innan lista (Joseph Kosuth) og í tímabundin verk og merkingar landslagslistar. Vorið 2013, birtu íslenskir fjölmiðlar fréttir af skemmdarverkum sem unnin voru í íslenskri náttúru. Ensk orð höfðu verið skrifuð á viðkvæm vistkerfi eins og mosa og spreyjuð á steina. Íslendingar urðu ævareiðir út í þessa eyðileggingu erlendra afla á íslenska náttúru, ekki einungis vegna eyðileggingarinnar sjálfrar heldur fannst þeim að farið hafi verið yfir mörk þeirra sjálfra sem einstaklinga og þjóðar. Ábyrgðaraðilarnir fundust bráðlega í Berlín og hófst þá seinni helmingur fjölmiðlafársins gegn þessum “hryðjuverkamönnun” en orðið “nature terrorist” festist við þá félaga. Málið varð að kæru og hafa þeir Julius og Julian ekki stigið fæti á Íslandi síðan þá. Ásamt verkunum Gígur (Crater) og Hraun (Lava) verða valin tölvupóstsamskipti milli listamannanna og hinna ýmsu Íslendinga sýnd. En eftir atburðinn fengu þeir félagar fjöldann allan af hatursfullum tölvupóstum frá íslenskum almenningi. Það er áhugavert að bera saman þessar tilteknu aðgerðir við annað jarðrask sem á sér stað í íslenskri náttúru, oft á mun stærri mælikvarða og með leyfi íslenskra stjórnvalda. Harðorð viðbrögð almennings beinir spjótum að spurningunum um hverjum er leyfilegt að raska nátturunni og hverjum ekki. Julius von Bismarck currently living and working in Berlin, Germany. He attended the Berlin University of the Arts and the Hunter College in New York City. He was the first artist-in-residence in CERN. His project Image Fulgurator was awarded the Prix Ars Electronica and widely acclaimed by a wider audience as well as presented in various media outlets like Wired, Arte and The Creators Project of Vice among others. Julian Charrière is a conceptual artist currently living and working in Berlin. He studied art at the École cantonale d’art du Valais in Switzerland before moving to Berlin to finish his degree. In 2013 he graduated from Olafur Eliasson’s Institute of Spatial Experiments in conjunction with the Berlin University of Arts. Charrière utilizes a range of artistic approaches including photography, performance, sculpture, and video to address concepts relating to time and society's relationship to the natural world. Both artists have exhibited widely all over the world. Bismarck and Charrière collaborated with the widely acclaimed site-specific performance “Some pigeons are more equal than others” at the 2012 Venice Biennale for Architecture. Kunst is a collaboration between Charrière and von Bismarck. It consists of photographic documentation of a series of ephemeral site specific interventions. It is a series of obvious and simple gestures, of naming by writing a single capitalised word in English upon pieces of land, forest, mountains, and so forth. The chosen word always corresponds to the surface on which it is written (‘Lava’ on lava, ‘Dune’ on a sand dune, ‘Mountain’ on a peak), superimposing the signifier on the signified. This ongoing project is indebted to both Conceptual Art’s insistence on the linguistic nature of all art propositions (Joseph Kosuth), and to Land Art’s involvement with ephemeral marking of specific sites. In May 2013, Icelandic news reported ‘severe vandalism’ of Icelandic nature. English words had been written on sensitive biotops, processes slow growing mosses had potentially been disrupted and stones been spray painted. 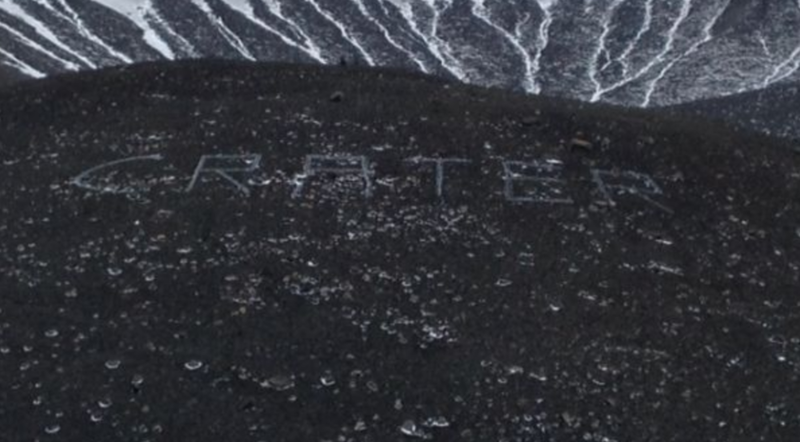 The Icelandic public was not amused, foreign graffiti on the surface of pure Icelandic mother nature was not only an insult but also violating all boundaries and norms. The responsible parties, two European artists were soon found in Berlin, creating a media storm in Iceland against these ‘nature terrorists’, a label they still carry. Charges were pressed and since then the artists have not re-entered to the country. In the Icelandic ambassador’s residence, we are also showing print-outs of a selection of emails that the artists received from Icelandic public. It is interesting to compare the impact of the artwork to other ‘jarðrask’ (an Icelandic term for human interference with the landscape) in Icelandic nature but not by a foreigner but by the government itself, sometimes for foreign interests. The intense reaction of the Icelandic people superimposes the duplicity of who is allowed to exploit the nature and who is not.